Ficus auriculata, the Elephant ear fig tree, is an impressive Fig species and it makes a great indoor plant for large rooms. Roxburgh's fig is native to India, Nepal, China, and Southeast Asia. 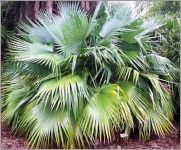 This is a evergreen to semi-deciduous, spreading, large shrub or small tree reaching 25 feet tall and as wide. Auriculata means, ear-like. Ficus auriculata is the Fig tree with the largest leaves in the rainforests of Xishuangbanna. The young evergreen leaves are starting intensely red, and turn more and more green when reaching their ultimate size of up to 50 cm length. It can also easily be trimmed and the plant reacts with even more shoots and leaves on a thicker stem. The new growth is a deep red. 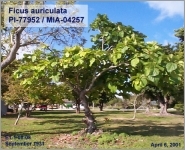 Figs form in clusters on the trunk and larger branches. 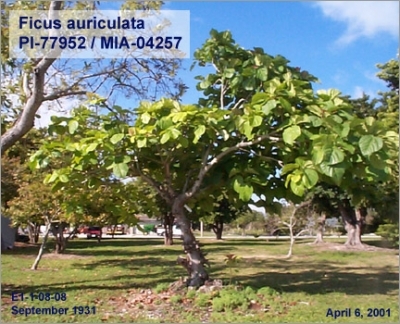 Ficus auriculata, Coconut strawberry fig, is one of the more delicious figs; all fig fruits are edible. The small round green figs are red inside. The flowers are pink and appear in mid-Spring.